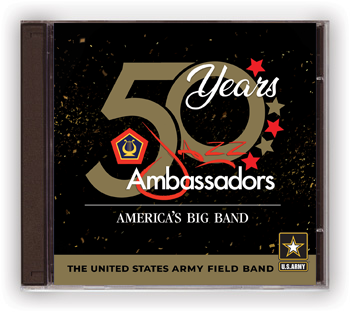 To serve and inspire the American people by telling the Army story and honoring our Soldiers and Veterans at home and abroad as The Musical Ambassadors of the Army. In 1968, Chief Warrant Officer Three Charlie Almeida formed a new performing component of The U.S. Army Field Band, a jazz ensemble he named “The Studio Band.” Fifty years later, the band is known as the “Jazz Ambassadors” and its legacy of service is recognized around the world. Its alumni include some of America’s most celebrated musicians, including Steve Gadd, Joe Mosello, Jay Saunders, Ray Brown, and many more. As part of its 50th anniversary, the Jazz Ambassadors released their newest album, 50 Years, which includes music from their beginnings in 1968 to their most recent in 2018. Dig into the liner notes for historical context as well as images of the band throughout the years.